Because sunshine reaches river banks through the opening over the river,and because banks are often battered and eroded by floodwaters, they are colonized by many of the same "disturbance" or "edge" plants, which come up in a forest clearing or at the edge of a field or on exposed, bare soil. Also, past farming, logging, sand and gravel-mining, or filling and grading for roads may have left their marks, in the woods by a stream or river, as elsewhere in the watershed. Unnatural landforms (berms, ditches, or pits), walls or foundations, or debris (tailings or brush piles) are important clues to past activities. Plants' growth forms and types of seed or fruit are also helpful in reading disturbance history. Disturbance communities occur throughout the watershed, from Meriden's urban stream banks, to temporarily abandoned construction sites, to hedges between Cheshire's farm fields, to fill banks along the salt marsh near State St. in Hamden. One excellent example of a disturbance community is the former Banton Street neighborhood in Quinnipiac River State Park in North Haven, abandoned and demolished by the State of Connecticut about tweny years ago due to severe flooding. Another is the former lakebed of Community Lake in Wallingford, which has grown up since the great dam breech of 1979. HOW DO THEY FUNCTION? A young patch of woods at a disturbed site is often written off as nearly useless. Although young woods may not appeal to hikers, they are preferred by many wildlife species like deer, ruffed grouse, and blue-winged warblers.Young woods have good protective cover and food for wildlife due to several common traits of colonizing plants: (1) bushy, fast growth in plenty of light and (2) abundant berries or seeds for good dispersal to newly disturbed areas. This is the case even for invasive, alien species like asiatic bittersweet. Many good colonizers also have function well as wildlife habitat, as colorful, if untidy, scenery, and for filtering pollutants. Dense thickets make well-hidden nest sites and offer good protection from harsh weather. Berries are important food forbirds like towhees and cardinals, some, like bayberry and sumac, linger through the winter, feeding many migrants as well. Abundant & relatively large grass & sedge seeds feed sparrows and rodents. The twigs and leafy undergrowth of a fast-growing "early successional" thicket provide plenty of browse for deer and rabbits. Thick, low vegetation takes up nutrients and pollutants as well as mature forest, and may even be better at filtering storm water carrying sediment. In time, there will be tall, scenic trees overhanging and shading the river, providing wildlife dens, and shedding leaf litter for the aquatic food chain. On the other hand disturbed young woods is apt to grow up into a forest with few plant species which grow poorly in bright light or spread their seeds poorly. Alien shrubs like Russian Olive and Multiflora Rose, and vines like Asiatic Bittersweet often crowd out native species. The reed phargmites also spreads rapidly in bright sun, crowding out other kinds of plants, until the woods is mature enough to provide some shade. READING DISTURBANCE COMMUNITIES Bare soils: Are there many plants with tiny seeds that are easily blown by wind - birches and speckled alder or fluffy-seeded willows and cottonwoods? Do you notice annual plants like orange-flowered jewelweed or the nettle relative, clearweed? Annual weeds and tiny-seeded woody plants have a hard time seeding into established vegetation, but readily colonize bare soil exposed by sediment deposits, erosion on river banks, or by human disturbance. Trees with larger, winged seeds like those of maples, elms, ashes, and catalpa are good at reaching bare soil on river banks. 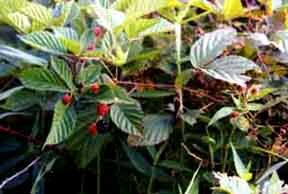 So are heavy berry producers like silky dogwood and red-fruited sumacs. Look for traces of earth-moving like ruts or berms. To identify fill, check for a lack of natural topsoil and buried debris, but watch out for hazardous materials! Pastures: Do you see a tree with a rounded shape next to many pole-like ones? This is a clue that the rounded one was once growing in the open, perhaps as a shade tree in a pasture by a stream. Are there many prickly or distasteful species? Livestock and most wildlife don't graze red cedar, multiflora rose, thorny black locust, and bitter black cherry. Species like sumac and locust, which sprout from parent plant's roots, do well in former pastures, where sprouts can survive better than seedlings. Stone walls are a another sign of former farmland. Lumbered areas and tree fall gaps: Even in mature forests logged in colonial times you can find clusters of trunks from stump sprouts of oak, hickory, and maple. Are there many light-loving heavy seed producers like birches and black cherries, which would have sprung up in a forest gap?